The International Baccalaureate Diploma Program is a rigorous pre-university program for highly motivated students in grades 11-12. Created in 1968, the rationale for such a sweeping and comprehensive program was twofold: first, to provide a common curriculum and university entry credential for students who often moved from country to country, and secondly, and perhaps more importantly, was the more idealistic motive that prevailed -- one that insisted students could share an academic experience that emphasizes critical thinking, intercultural understanding, and exposure to a variety of viewpoints. IB courses were introduced in 1985. Graded’s first IB diploma was earned in 1988. 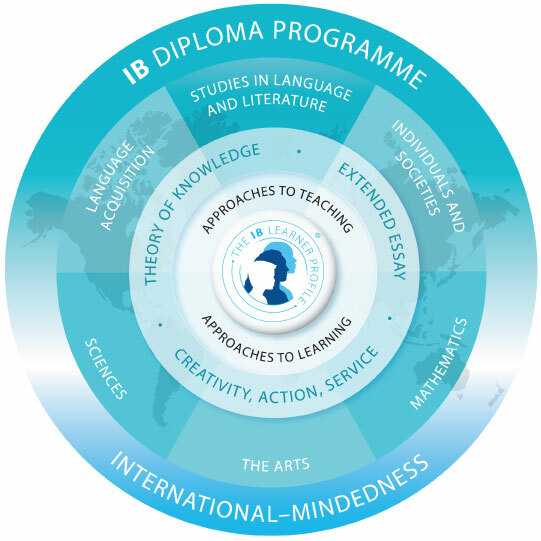 The IB Diploma Program is a comprehensive two-year course of study with the strengths of a liberal arts program, but with requirements that set the IB apart from other advanced placement programs: Theory of Knowledge(ToK) is an interdisciplinary course intended to stimulate critical reflection and analysis, and to encourage appreciation of other cultural perspectives. Creativity, Action, and Service (CAS) requires students to share their talents and energy with others, especially in community service. The Extended Essay (EE) is a 4000-word investigative essay on a topic of special interest to the student. For the full diploma, students take 6 subjects, normally two-year courses, with 3 at Higher Level (HL) and 3 at Standard Level (SL). Language & Literature HL, SL (offered in English, Portuguese, and Spanish). Learn more about the IB at Graded through the Course Handbook. explore a real-life/contemporary situation from a TOK perspective in the presentation. The International Baccalaureate aims to develop internationally minded people who become active, compassionate and lifelong learners who understand that other people, with their differences, can also be right. CAS is at the heart of the diploma program. You will be involved in a range of activities beyond the academic classroom. CAS enables you to enhance your personal and interpersonal development through experimental learning. It provides a counterbalance to the academic pressures of the rest of the Diploma Program. It provides a journey of self-discovery, while being challenging and enjoyable. experience the excitement of intellectual discovery.